#09 - Great Value. Completely updated. Best Location. Enjoy a vacation away from the crowds. 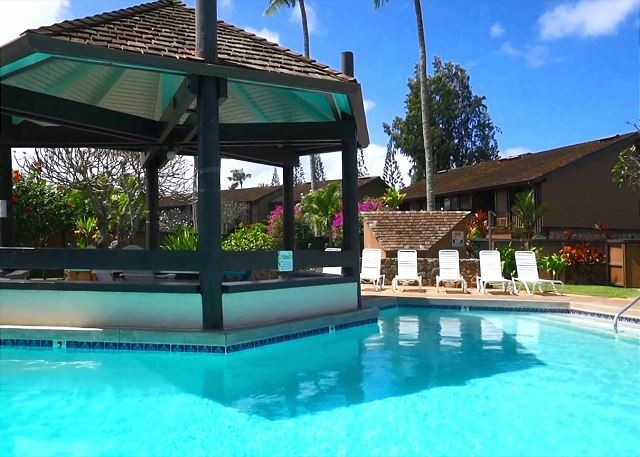 This newly updated and tastefully furnished town home is nestled between pristine sandy beaches and beautiful mountains, at the Turtle Bay Resort. Miles of empty pristine beaches are just a short walk away, perfect for beach combing, sunbathing, relaxation, snorkeling, diving, surfing, kayaking, etc. Enjoy this most desirable location on the first hole of the Fazio Golf Course, facing the ocean and sunsets. 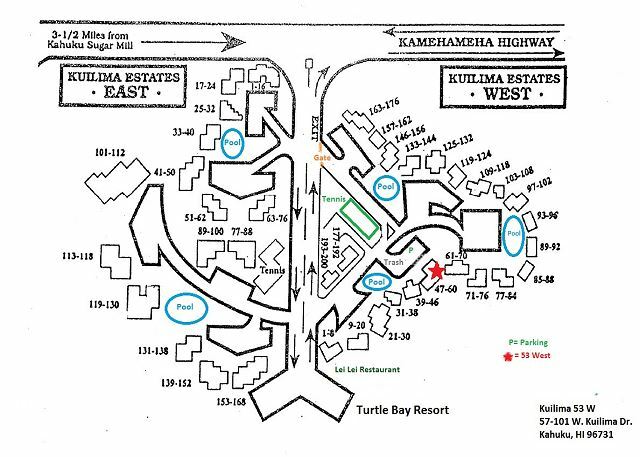 At the Kuilima Estates West. Beautifully furnished with a mix of Bali meets Hawaii. This 1 bedroom 1 bathroom, ground floor, town house was completely remodeled and furnished in August 2011. It sleeps up to 4 people: a queen size bed in the bedroom with A/C, and a sofa bed in the living room. Very well equipped with flat screen TVs, DVD, WiFi, movie library, tennis racquets, snorkeling equipment, boogie boards, etc. Travertine floors, granite countertops, cherry cabinets, stainless steel appliances, all new fixtures, paint, switches/outlets, tub, etc. Conveniently located but away from it all. Turtle Bay is a unique area located on the pristine North East Corner of Oahu. Four miles to Sunset Beach and Pipeline. 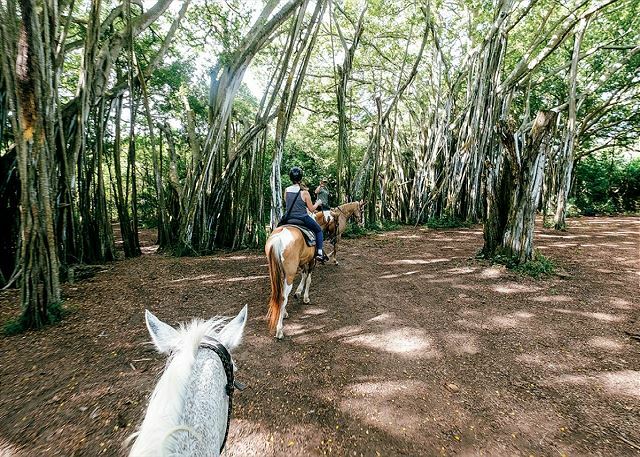 It is 12 miles to Historic Haleiwa town, 15 miles to the Polynesia Cultural Center, 45 minutes to Honolulu Airport and 6 hours from the West Coast. 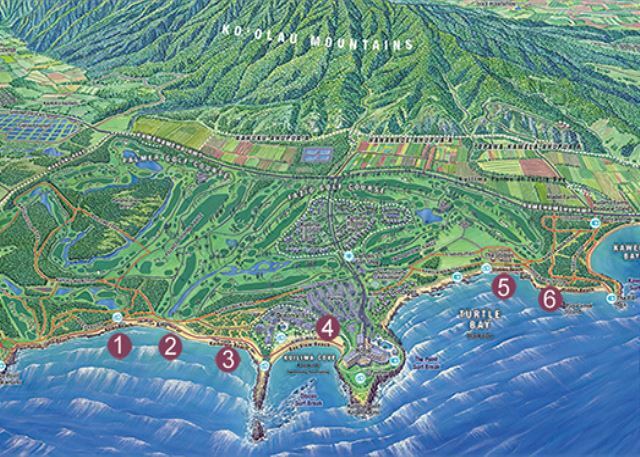 The resort area includes a 350 room luxury beach resort, two world class golf courses (Fazio and Palmer), four great restaurants, a few surf spots, trade wind breezes and sunset views. 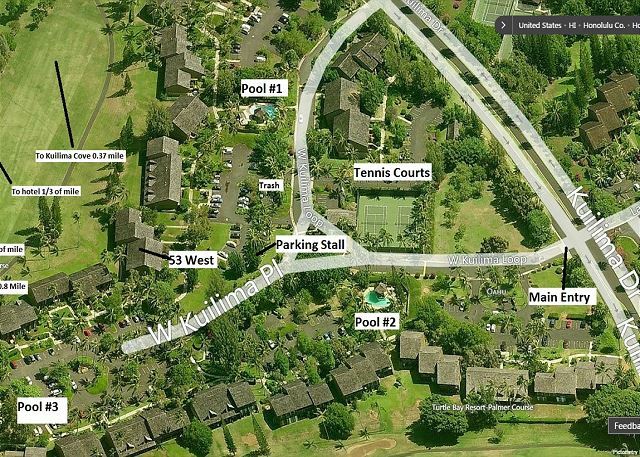 The Kuilima West sits on the skirts of the Fazio golf course and features manicured landscaped grounds, three swimming pools, two tennis courts and walking paths. Unit 53 is a ground floor unit of approximately 780 sq. ft. with a screened lanai. Located on the west side's gold coast, facing the ocean, first hole and sunsets. Just 0.3 miles to Stables beach and the resort, less than 1 mile from Kawela Bay. Rates from $980/week. Call 808-637-3510 or email teamre@hawaii.rr.com for a rate quote and availability. Minimum stay of 7 nights, shorter stays possible at the managers discretion. This was our honeymoon 19yrs late. Kuilima was a quiet place to chill for our vacation. Lots of trails to walk, hoseback ride, fantastic beaches within walking distance. Located on a beautiful golf course. Enjoyed watching the golfers and lots of exotic wild birds! All is landscaped beautifully. Close to grocery stores and the fantastic Polynesian Center. My wife and I have stayed at this apartment 4 times now. It is always very nice. The apartment is clean and cozy for up to 4 people. The condominium has good security. It is walking diatance from Turtle Bay Beach. It is in a golf club and has 3 restaurants, a swimming pool, tenis courts, horseback riding, bike rentals and hiking and running trails. The apartment is completely furnished with an equipped kitchen. The owner is very accomodating and goes out of his way to make sure we have everything we need. We will definitely be back next year and will stay here again! Had a wonderful time on the North Shore. The condo is in a great location and a short distance to restaurants, markets and food trucks! Very clean, comfortable and relaxing. You can enjoy the beach or swimming pools. The property is well maintained with a gorgeous view of the golf course. Love the sound of birds chirping and views of green foliage everywhere. The perfect getaway. Will definitely be back. The location was definitely wonderful! Husband and I stayed in a one bedroom condo and the price was affordable! There's a pool and golf course beside us and the complex is not too far from the beaches. It was very convenient for us to stay there close to family members staying near Hukilau Beach, but also distant enough to feel like we were at a getaway. My only recommendation is to get new pillows because they were so flat. The bed was too soft for me, but that's just because I am used to something more firm. The AC was rather loud and it was difficult to have a balanced temperature. We were either too hot at night or too cold. Nonetheless, we would recommend the place for any couple who isn't looking to spend so much but still wants to relax and enjoy the North Shore area. Very clean and beautiful home. We were pleased! Lovely, peaceful, perfect location, lots to do, the rental was clean and had everything we needed. Would definitely stay there again!! 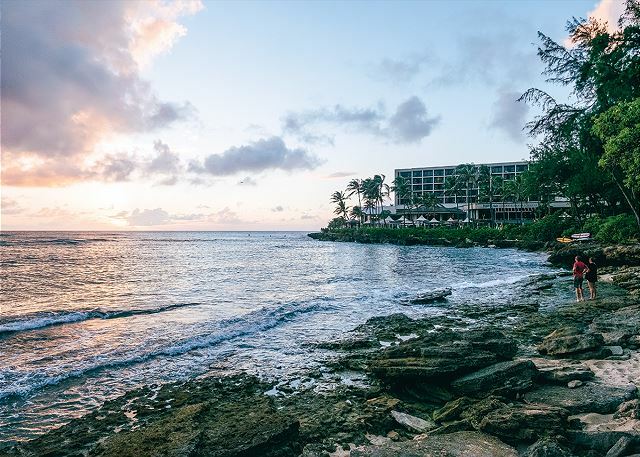 My experience and stay at the turtle bay condo was a wonderful everything was perfect.the property manager was very helpful I want to thank to Sophia she answered all my questions she was really professional. i just want to said Its a beautiful condo right on the golf course. It was clean and well maintained, very close to Halewai town, north shore beaches great location. We cannot wait to go back. We had a great stay in Kuilima West. The condo was neat and well-cared-for. We were also blessed with breezes that kept the place comfortable without air conditioning. The kitchen facilities were very good. And the location was a bonus; we were able to walk to a couple of different beaches, and we could drive easily to such local landmarks as Ted's Bakery. 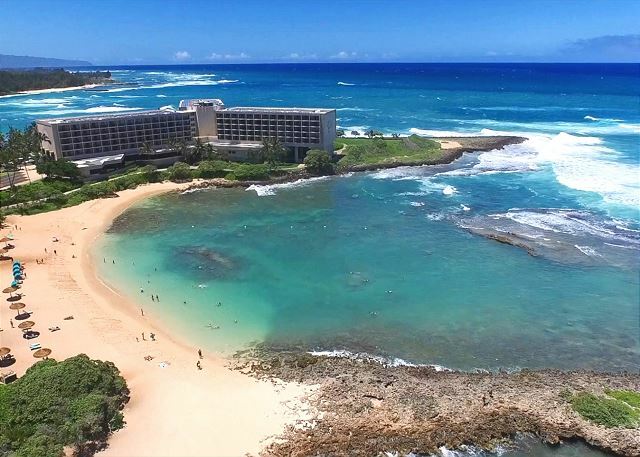 My experience and stay at the turtle bay condo was a wonderful withteam real estate . Sophia I believe contacted me intialy and answered all my questions. I booked this condo last minute as a birthday trip.all the pictures were accurate. Its a beautiful condo right on the golf course. 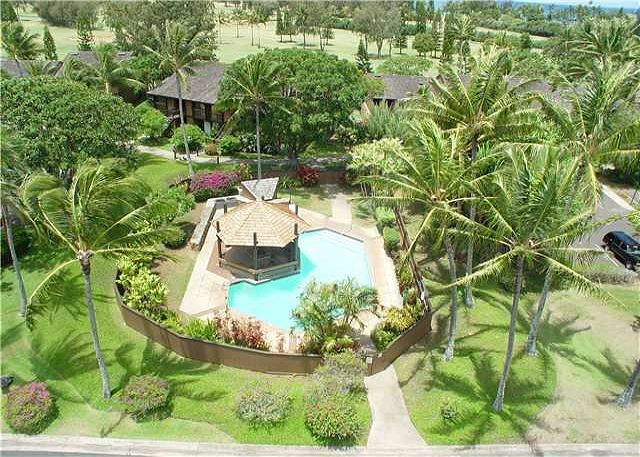 It was clean and well maintained, very close to Halewai town , north shore beaches great location. We cannot wait to go back. Great place to stay! Could not ask for a better location. The house was in perfect shape, very clean and very comfortable! The owner, Roberto, welcomed us warmly and helped us throughout our stay! Reservation process, check-in/out, everything worked-out perfectly. Will definetely be coming back! It was the perfect spot to rest and relax. Very comfortable and homey. we were happy with the accommodation and the kitchen facilities as well as nice to have the indoor washer/dryer ensuite. We had a nice view of the golf course and also enjoyed the ability to visit the golf course and hotel restaurants. The fridge has a slow water leak which may need attention in future but it did not concern us. We thoroughly enjoyed our stay at 9-53 Kuilima West and will happily recommend it to others and hopefully stay again. We enjoyed the location and the amenities. There was an issue with the unit above our unit leaking and the owner of our unit promptly contacted me to inform me and then resolved the situation prior to our arrival. Clean, neat, and well equipped to give you a home base for a great get away. It was perfect for our father daughter get away. Close to the best of the north shore. I will be back. 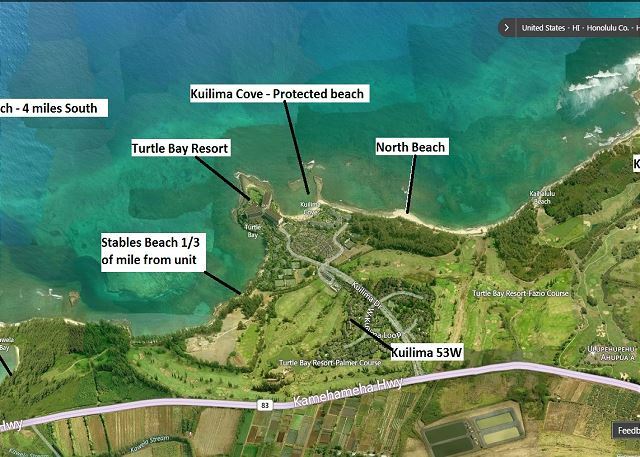 This is an exceptional value in a great location, almost part of the Turtle Bay Resort. The unit was clean with lots of towels and linens and a full kitchen, and even some left over food from previous visitors. Felt secure with gate-key entrance to the property. Several pools to choose from. No spa, but then we knew that. We had some questions before arriving, and the management team was very responsive and helpful. Easy access to all the North Shore beaches as well as the east side of the island. Would definitely stay here if we visit the North Shore again. I am very happy with my stay at this location. It is perfectly located to where the attractions are and where the wedding we attended. The house was clean and complete with everything we need. The only negative I have for my stay is that you have to travel 12 miles to get the key. I have other relatives who rented the same condo unit and they just give them a code to enter and get the keys. Cute place. Great location. Only complaint - it was hot. There is a air conditioner in the bedroom, but the main room was hot! The breeze didn't help much. Other than that, we loved it and would stay there again - just not the end of July or August when it is so hot. The condo was exactly as described/pictured in photos online. It was extremely clean and ready with toilet paper, towels, and kitchen supplies. The only AC unit is in the bedroom, so the rest of the home can get a little stuffy if it's not early morning or evening, but that is to be expected in the summer in Hawaii. The condo was ready early and we were very pleased with it for the price we paid. 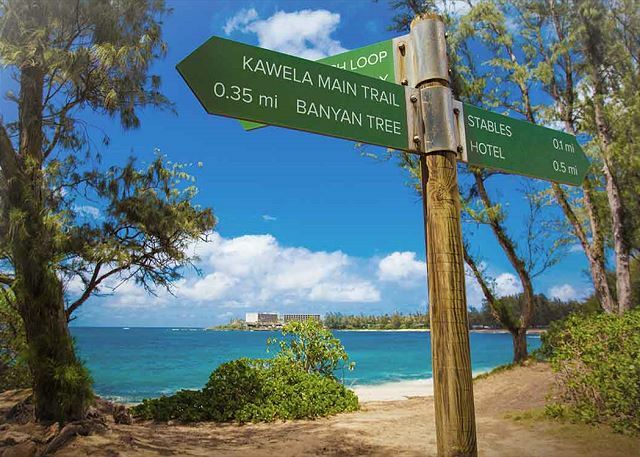 It was a very easy walk to Turtle Bay resort and the resort was wonderful about letting us use all of the described amenities. The parking situation at both the condo and the resort was great, but don't forget to hang your parking tag! They do check for that. My son (13) and I ADORED this little condo. It was perfect for our needs and we will 100% stay here again. We loved everything about this unit and would not hesitate to recommend it to anyone we know. Best vacation you can ever have! Amazing condo! 100% satisfied! thanks Team Property! Our vacation rental experience was phenomenal! The location was great because we got to experience more than just tourist attractions, we got to experience the heart of North Shore. The locals were so friendly and we already felt at home within hours of arriving. The food carts and beaches were some of our favorite places to eat and relax! 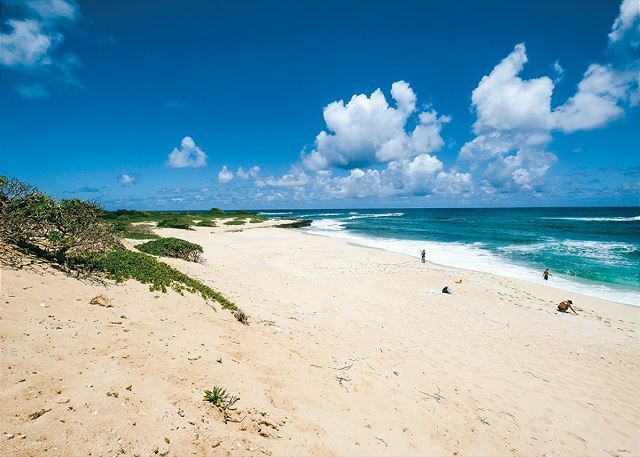 One of our fondest memories was watching the surfers at Sunset Beach and Waimea Bay Beach which was just down the road! Our rental was stocked with everything including boogie boards and snorkeling equipment that we put to good use which was rather nice since we didn't bring any with us. Kuilima 53 was in wonderful condition and so incredibly easy to maintain seeing that it was like new! We had no problems what so ever and most definitely want to come back in the near future! I would and have already recommended this rental to friends and family. In fact one of the people we traveled with whom we had over for dinner one night was in awe and fell completely in love with our rental as well! We couldn't have asked for anything more! Thank you! First I want to comment on the location of the condo. 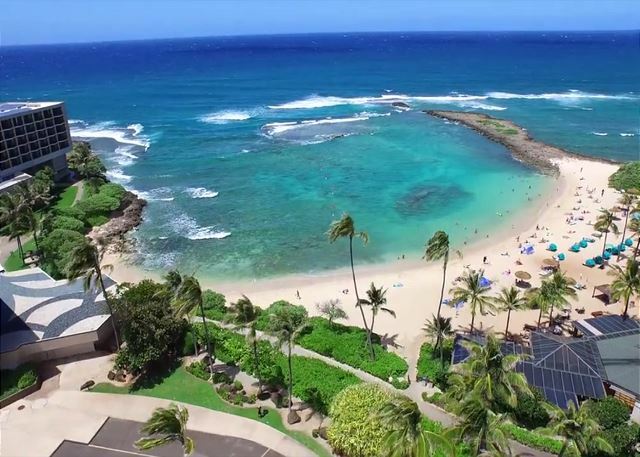 It is located a short 10 minute walk from the turtle bay resort and of course one of the greatest snorkeling locations on the north shore kuilima Cove. We stayed two weeks here and walked back and forth several times a day. Most days we rented a cabana on the beach as it was super cheap. The condo has beach chairs, umbrellas and some snorkeling stuff. We had our own. Second, I would like to discuss the kitchen at the condo. It does not come supplied with spices so you will want to make sure that you pick some up. It does however come with everything else you will need to cook every meal there. The coffee maker has a filter so you you won't need to purchase filters. We ate the majority of our meals at the condo but did eat out dinners at the resort on a few occasions. The location to the resort is so convenient. Lei lei's restaurant on the golf course is only a few steps away and was a great meal! THird, the condo was supplied with plenty of blankets, towels and pillows. The bed was comfortable, though my daughter stated that the day bed in the living room was not the best. Fourth, the lanai is wonderful. It has a small table with four chairs that was perfect for eating dinner at. The view of the golf course is amazing and I will miss that the most! Lastly, this was our second stay here and like the first time dealing with team real estate was easy and friendly. We picked our keys up after hours and returned them after hours and the process was smooth. 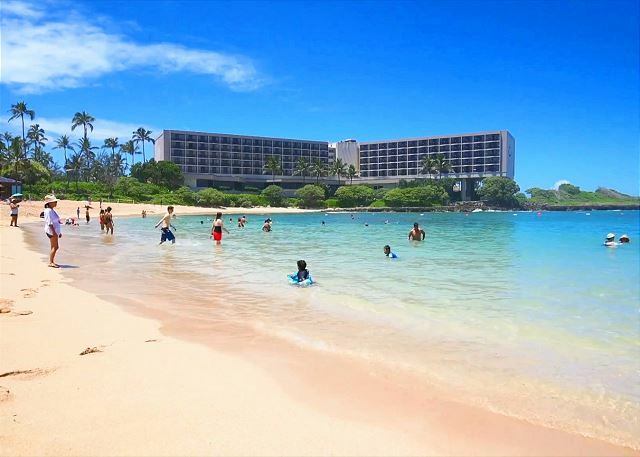 If you are looking for an affordable place to rent on the north shore next to turtle bay resort then this is where you should book! Very happy to find a good value condo in the Turtle bay resort. Turtle bay is a great resort with resturants and lovely facilities. Key pick up was efficient and easy. Condo was clean and very well appointed. Lovely kitchen with everything you need. Small issues will the air con. It is dated. The bedroom unit we could not get to work and therefore there was high humidity levels in the condo so it can smell musty. However the fans did help. Loved the wifi, Netflick and the beach equipment was a lovely addition to the holiday. Overall good value, very clean and good location. We also recommend Team Real Estate- very friendly, trustworthy, and professional company. The condo is nice but all furniture needs to be updates. It is very uncomfortable. Living room furniture does not have enough padding. Televisions are to low. Mattress on bed needs replaced and the elastic on the sheets is worn out. All amenities were great. Location is good if you want to be away from everything. We brought our kids for their first Hawaiian experience. This was a great place for a family of 4 to stay. We always prefer cooking our own food on vacation and found the kitchen well stocked with everything we needed to cook here. We enjoyed having boogie boards, chairs and umbrellas provided. The condo was clean, fully stocked with bedding, towels and such. Exactly as described. Enjoyed our time very much! the beach so close by. Um excelente lugar para ficar no Hawai com a família, muito bem equipado e localizado no north shore. We enjoyed this property. We liked the access to the resort and it's trails for early morning runs. We were on island for a race at Kualoa Ranch so the location was key. There are a couple of things...we love to cook and the kitchen knives are pretty much useless. We went out and purchased our first set of travel knives (this isn't the first rental we've come across with knife issues, so our new knives will get plenty of future use). Also the couch and chair were not that comfy. we get up at 4 and spend the day doing hikes and exploring and are come back to the rental by 6p to make dinner and relax. The furniture in the living room made that a bit uncomfortable...and then I severely sprained my ankle and had to sit on that couch for 4 days straight. It was the first time I couldn't wait for vacation to end. But that had more to do with my physical discomfort than anything else. The kitchen is fairly well stocked with spices, some olive oils, cooking spray, we left some nice balsamic vinegar. There are grill pits at the pool. There was some charcoal at the condo when we arrived, but we went out and bought more as we grilled almost every day. We only had one major 6:40 pm, we were coming back, as we exited the car we were laughing about something and a security person scolded us for making 6:40p! I thought that was a little uncalled for especially when the next night there was a full blown domestic dispute with shoving and yelling and screaming right outside our bedroom at 3am that went on for some time without security intervention. Again, it happens, I get it, nothing is perfect, but this place is really nice and we would come back. The proximity to Oahu's most iconic beaches was fantastic. We snorkeled Sharks Cove, had beach days at pipeline, sunset, and waimea bay. We went with a convertible rental car and enjoyed three trips into Honolulu via different routes across the island from Turtle Bay. All routs take about an hour but it's very beautiful scenery everywhere. The Condo itself was pretty standard. Typical Hawaii, there were small ants that swarmed any piece of food left on the counter. As long as you stay clean, the ants seemed to stick mainly to the trash area. One cockroach found in the bathroom on our last night, but never bothered us, just hid behind the toilet. It was very nice to have laundry in the condo, the living room was open, with comfortable seating. Nice TV with DVD and some movies. Cool tile floors with dark wood furniture. The bedroom was nice too. Big enough bed, AC unit to keep things cool. Flat screen tv with cable, big closets and dresser space. No pests in the bedroom at all. My favorite part was the screened in Lanai out back. It was a great place to drink coffee, watch golfers, and enjoy the morning sun before the days adventure. You may want to buy laundry detergent before you arrive as it was not provided. Lastly, the proximity to the actual Turtle Bay Resort was perfect. Just a 5 minute walk to a great snorkel and swimming beach, bars, restaurants, convenience store, cafe... It was really nice. The owner has boogie boards and some snorkel gear to use. We rented fins in Halieva. This rental condo was clean, nice, and in a great location. We had a wonderful time there and the scuba equipment included with the room definitely came in handy. I was very satisfied with this rental! My husband and I got married at Turtle Bay Resort and were looking for a cozy place to call home for our two weeks on island. I saw the online photos of the beautiful full kitchen and was sold. Roberto and his staff were so helpful and professional, I couldn't ask for better! To our delight, when we got there we found the condo was in literally perfect condition and came with luxury amenities, a full kitchen with lovely pots, pans, a baking sheet, dishwasher, foil, plastic wrap, Ziploc bags (probably left from previous guests) even olive oil and some spices so we could cook anything our hearts desired! There was even a supply of Tupperware to store our leftovers. As foodies this is so important to us and we were very satisfied. 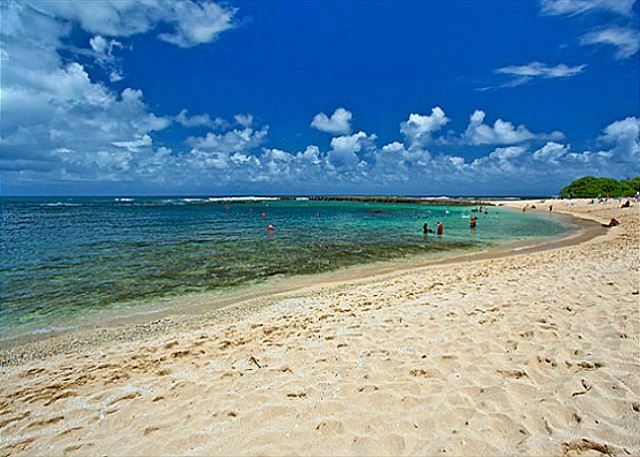 We loved the location, just a short walk or drive to Turtle Bay and all the local North Shore beaches and attractions. It had its own assigned parking and plenty of guest parking, which made things so much more convenient when we had our friends and family in town. This condo had a lot of nice extras, which added a ton of value for us. For example, the decor was a luxury beach house feel with Plumeria, Pineapple and Ocean Wave themes. You get a lovely screened in lanai with a nice round table and chairs, so you can enjoy the Hawaiian sunset over a nice meal outdoors without being bitten up by mosquitos. The screened lanai opens up to the beautiful George Fazio golf course. We even enjoyed using their snorkels and body boards that they laid out for us! They even had tools in the house in case you might need one. Even better was the price. We felt we got incredible value from this rental and that Roberto, Kathy and all the folks at Team Real Estate are honest people to do business with. This condo was the perfect place to make our most treasured memories and we would rent from Roberto & Team RE again in a heartbeat. Thank you for everything & aloha!!!! Just want to thank you so much for letting us stay at your beautiful townhouse. This was our first time that we did a VRBO and it was a very good experience. We enjoyed that the location was close to everything and that it was off the main visitor strip. The townhouse was well equipped and it was so nice to be able to stay in and fix our breakfast. It was easily accessible to the beach and other sites, most were within 45 minutes. Again thank you so much and have told others about your townhouse. Great location to see the North Shore. Surfing beaches were awesome! Condo grounds were beautiful. Condo unit was immaculate and very well equipped. Loved the dishwasher and washer and dryer on site was great. Bed not to our liking and the furniture was not comfortable for us - but then we are short people. Unit had a pleasing view of the golf course, was tastefully decorated but I could have used a good reading light and a more comfortable chair. We had a wonderful time at this condo. It is our 2nd time here and it is just as nice as the 1st time. The condo is well situated near the pools, beach and trails. It is easy to get to the grocery stores as well as the famous Sunset, Pipeline and Waimea beaches. The condo is nicely updated with a well stocked kitchen. They have everything you would need to enjoy the surf and sand. The owner is very easy to deal with. The condo is just advertised. We can easily recommend this vacation condo. We have family that lives in HI. Our grandchildren enjoyed a dip in the pool. Our children loved the restaurants. Then they went home and we enjoyed the long walks on the beach. 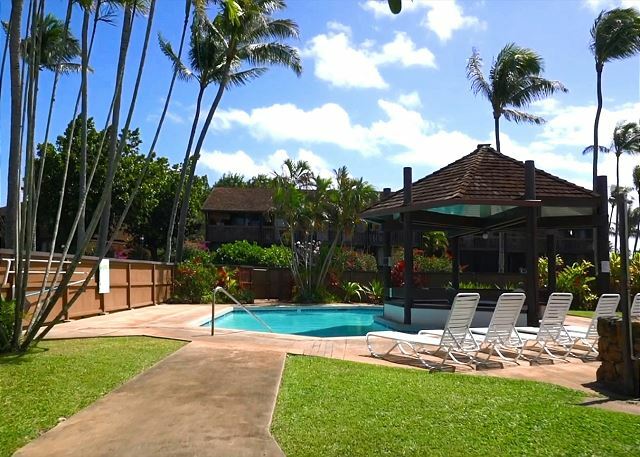 Awesome condo rental located just minutes away from the North Shore of Oahu. Great amenities in the unit and property (pool and tennis courts) and just minutes from a public beach that is appropriate for all ages. Wonderful dining in the area at Turtle Bay Resort and in Haleiwa. I was a very beautiful condo. it was also quite "homey" Made our stay there very comfortable. My only complaint is that the towels used for the bathroom should be replaced. I ad to wash them quite often due to the smell of mildew. There were plenty of towels for my family and I to use but i did end up buying some personal ones because I felt the ones there in the condo were old and smelled moldy. Besides that I felt like the condo was very well equipped and not only comfortable but clean. We really enjoyed staying there and hope to get to stay again soon! My husband and I spent the month of November in 53 West and had a wonderful time. It was our fourth stay at Kuilima Estates, we love the North Shore and enjoyed long walks on the beach, golf and exploring. The condo was perfect for our needs and we found it very clean. This condo was the perfect stay! I live an hour away and did not want to drive home for three plus days while enjoying the North shore and Turtle bay golf. 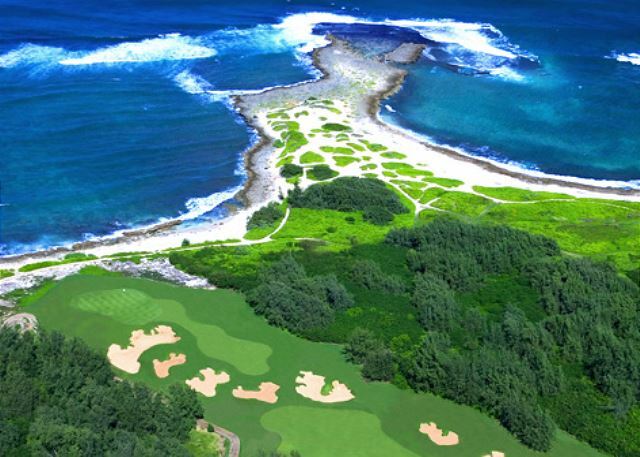 Location is right on the 1st fairway of the Fazio course and walking distance to all the amenities of Turtle Bay. Condo is PERFECT and highly desirable. I will be back. Thank you Roberto and staff!!! We had a great time at Kuilima Estate. 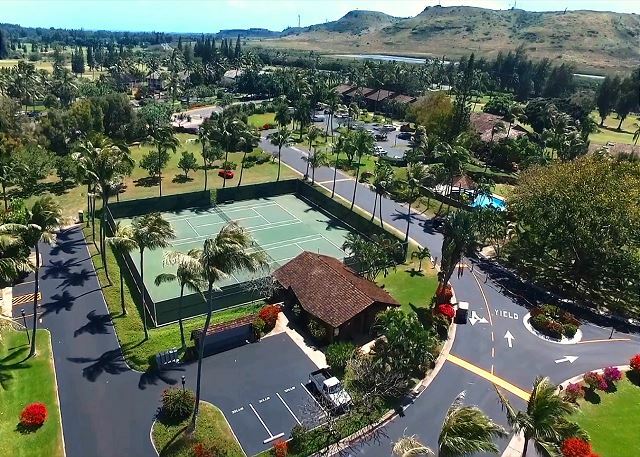 The Property is within walking distance to Turtle Bay Resort and some beautiful beaches and Golf Course.Close to all the North Shore attractions. The property management company was very professional and pleasant to deal with. We loved the north shore and hope to stay again one day. Private and safe location. Professional upgrades. Acacia koa wood furnishings. Would easily rent again. The condo was spotless! We chose this location because it is located Turtle Bay Estates. It was very close to the beach and most amenities. We especially appreciated the thoughtful touches such as snorkel gear and extra movies for us to use. We would definitely stay here again, it is a lovely place with a modern feel. Very nice location, very clean with all of the beach toys there as well as the kitchen having everything I needed. The condo was as advertised tho the description of the remodel and view overoptimistic. Arrived on Sun and left on Sun, never actually met or spoke to a rental agent, but no problems with key or access. All the condo's at this location appear to have similar floor plans. This ground floor unit was dark, and view out the lanai was screened by vegetation and a long wall of the neighboring units. Good kitchen and proximity to resort amenities. Unrepaired damage in bathroom, relatively uncomfortable furniture, poor lighting. Don't want to sound too negative, it was fine for our purposes. We recently had the pleasure of staying in Kuilima 53 West for 13 days. The condo was immaculate when we arrived. The unit is very private, quiet, and peaceful. We loved sitting in the screened in lanai whenever we were at the condo. The lush foliage outside both the front of the unit and back lanai was beautiful and created an area of natural privacy. 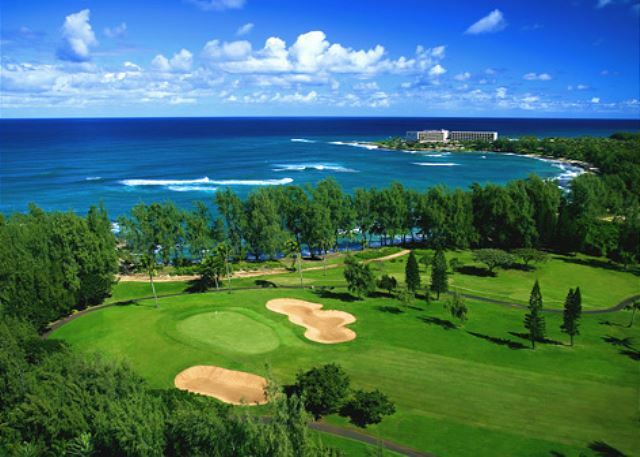 We were within walking distance of the Turtle Bay resort, golf courses, and beaches. We hardly used our car at all, except to go to the grocery store! Roberto and his team were wonderful, very professional, friendly, and easy to work with. 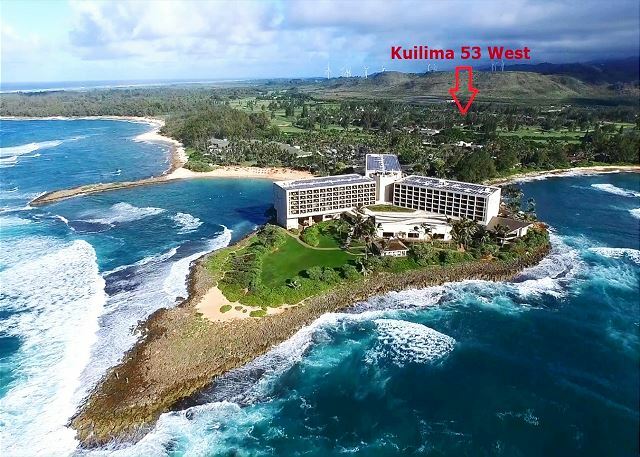 Our whole experience was exceptional and I would encourage anyone wants to stay at a beautiful, well equipped and cared for condo to choose Kuilima 53 West. We are already planning our next vacation there! Thank you Roberto! It took my husband and I five years to take our honeymoon!! Hawaii and this place was worth the wait! I would Never EVER stay in Wakiki. This was PERFECT!!! Perfect location, comfortable, and helped us keep our food budget low! Seriously I can't stress this place was nice and in the PERFECT location. The only thing was the AC in the master bedroom wasn't our favorite, and the Washer Machine wasn't the best. But neither were reasons not to use this place. I'm freaked out about bugs and all we saw were the normal ants. NO COCKROACHES!!! I promise you won't regret staying here! Everything was great!! The only tiny minor complaint that we have was that the air conditioner in the bedroom was super loud. It often woke us up. Other than that, everything was wonderful. We really enjoyed the condo and the property overall was super. AC in bedroom was loud and cleaning crew should be replaced. We cleaned for an hour when we first got in. The vacuum had to be cleaned out before we could vacuum but once we went over it really well it was fine. We like the decorations and the bathroom sink was cool. We found great trails to run and walk on nearby and the ocean views from the property are great. The location is great for getting to everything northshore which is what we wanted. We would stay here again! 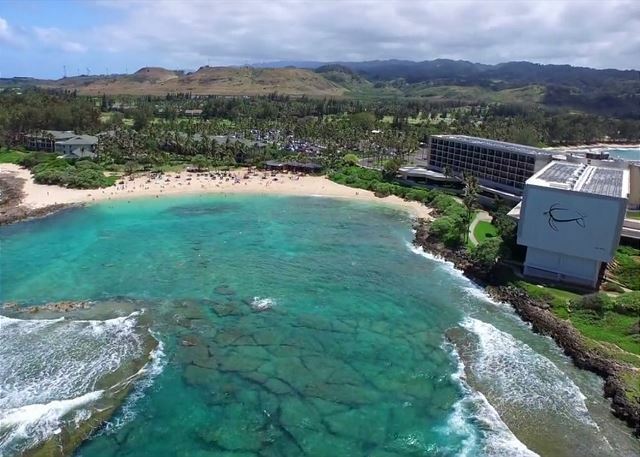 Just had the best time on the North Shore of O'ahu,, We stayed in Kuilima Estates, the condo was perfect, conveniently located just outside of Turtle Bay Resort- which availed us to a few nice meals,fabulous views & great evening entertainment.. The condo is well stocked with everything you need for a comfortable stay-I was able to prepare meals to enjoy in the screened lanai! My two sons that live in O'ahu gave us great tours of all the surf spots & great local color.. A great time was had by all, Would recommend the condo with no hesitation! !